This documents provides instructions for FormSmarts members to protect access to their account and ensure their forms are submitted via a secure encrypted connection. The information in this document only applies to Business account. Free and Pro accounts do not support two-step verification and forms associated with those accounts cannot be submitted using a secure encrypted connection and are thus not suitable for collecting personal information. The first step towards securing your account and the data you store with FormSmarts is to prevent unauthorized access: set a strong password and enable two-step verification. Please check the strength of your current password by typing it in the password field on FormSmarts' registration page. If the score reported by the strength meter is anything other than ‘good’ or ‘great’, change your password immediately. Passwords must contain a minimum of 8 characters, with a maximum of 100 characters. 10 characters or more is recommended. Do not use a password you already use on another site. Do not use simple passwords based on dictionary words or character patterns like 'qwerty' or '87654321'. Avoid obvious substitutions like '0' for 'o' and '1' for 'l'. Passwords may contain non-English characters (ñ, 美,…) if your browser allows them and whitespaces. Whitespaces are ignored at the start and end of a password. To change your FormSmarts password now, visit this page. Ensure your password is not written anywhere where it could be accessed by a third party. Never click on ‘reset password’ requests in emails — instead go directly to the FormSmarts homepage and follow the password reset link on the login screen. FormSmarts staff will never ask you for your password. If your forms are sent to multiple email recipients, please create a guest user account for each of them and only give individual users access to specific forms. Do not share your FormSmarts admin account credentials with others within your organization. We recommend you turn on two-step verification to increase the security of your account. Two-step verification adds another layer of security to the log in process and helps prevent unauthorized access to your account and protect the data you store with FormSmarts. Two-step authentication is required for members with forms using the secure mode. 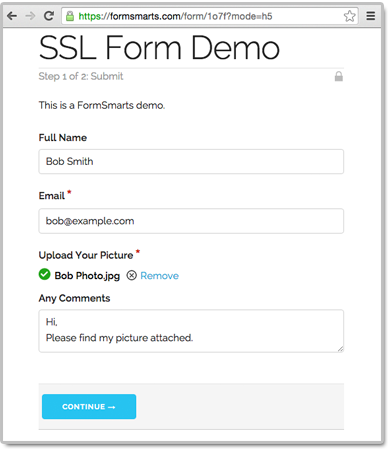 To prevent form data from being accessed by a third-party when a form is submitted, make sure the FormSmarts.com URL or f8s.co shortened URL you share with form users starts with https. If you've embedded forms onto your website, check that the embed code you use on your site only contains HTTPS URLs. With the current version of our forms, a grey padlock is displayed on the form when it is loaded and submitted with HTTPS. Information is indeed submitted to and retrieved from FormSmarts servers. The current version of the embed code and form URLs given by the form builder use HTTPS by default, but that wasn't the case in the past. If you created a form and added it to your site many years ago, the URL or embed code may not be using the HTTPS URL. You'll need to update your site to change this. <a href="https://formsmarts.com/form/1o7f?mode=h5">Can't see the form? Click here</a>. If the FormSmarts embed code you're using doesn't look like the one above, please switch to the current version of FormSmarts forms. After implementing the changes discussed in the last section, all information transiting between form users and FormSmarts when a form is submitted will be exchanged using the standard secure protocol (SSL/TLS). Data is always encrypted when you access form entries on FormSmarts or export entries to an Excel spreadsheet, however it might not always be when FormSmarts delivers email to your mail host. The risk of someone getting access to the form entry if the email account of one of the destination emails of the form is compromised even years after the form was submitted (probably a far greater risk given that many people keep messages archived in their email account forever). FormSmarts delivers email using an encrypted connection if supported by your mail host. Most mail providers nowadays support encryption, but if your email server doesn't, we will deliver form responses via an insecure connection. For this reason and to address the second risk, you can set up yours forms to use the Secure Mode1. With FormSmarts Secure Mode, email notifications do not contain form data, but only a link allowing authorized users to access the form entry online after signing in to FormSmarts. Data storage must be enabled with the Secure Mode. The data submitted is not shown in email notifications with the Secure Mode, so data will be lost unless data storage is enabled for that form. The Secure Mode activates a number of other security features on FormSmarts. If you would like to set up a form with the Secure Mode, please contact us. The Secure Mode is only available with FormSmarts Business Max package and higher.